The main difference between seed and grain is that a seed is an embryonic plant whereas a grain is the seed or fruit of grasses. Furthermore, the three main parts of a seed are the embryo, endosperm, and the seed coat while grains contain an additional part called the pericarp or bran. Seed and grain are two structures produced as a result of the sexual reproduction of higher plants. Also, nuts are another type of seeds produced by trees. The seed is the fertilized ovules produced as a result of sexual reproduction of higher plants. 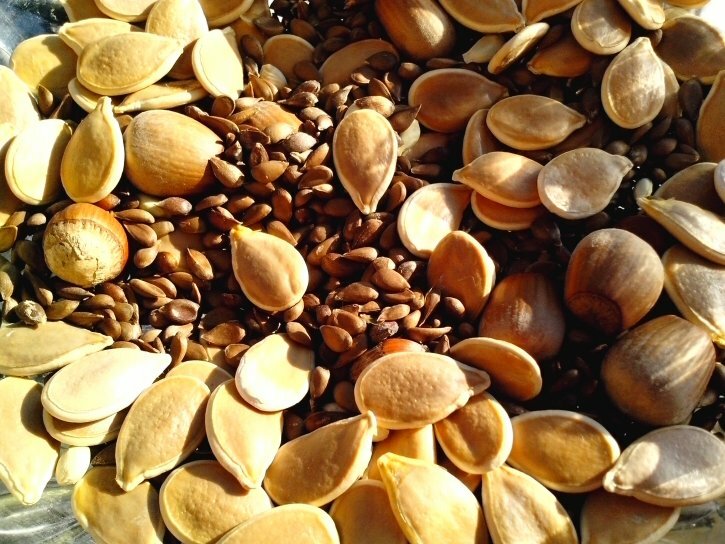 Each seed contains an embryo, which can germinate to produce a new plant. Moreover, both angiosperms and gymnosperms produce seeds. In angiosperms, a fruit covers the seeds while gymnosperms do not produce fruit covering the seeds. Therefore, the seeds of gymnosperms are ‘naked’. However, seeds are an advanced method of dispersal of plants. Furthermore, the three main parts of a seed are the embryo, endosperm, and the seed coat. The embryo is the developed zygote, which further develops into a new plant. 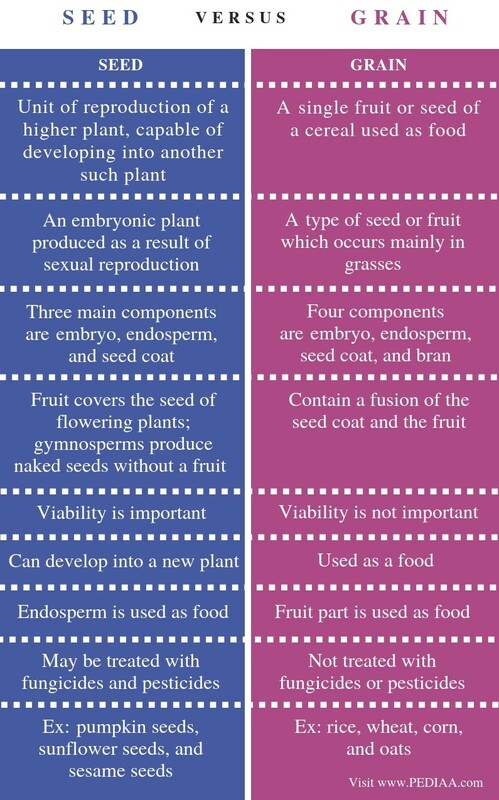 Secondly, the endosperm is the part of the seed, containing nutrients. It is formed as a result of triple fusion, which only occurs in angiosperms. Thirdly, the seed coat is the protective layer, which keeps the embryo safe. A grain is the seed of the grasses. Significantly, grains do not contain a fruit. This is due to the reliance of these seed on the wind for their dispersal. The four components of the grain are the embryo, endosperm, seed coat, and the bran. Here, their embryo and the endosperm are similar to those in a regular seed. The additional part of a grain is the pericarp or the bran. Wheat bran, rice bran, and corn bran are examples of bran, which is a mineral-rich, hard outer covering, protecting the embryo and the endosperm. Actually, bran is a part of the fruit, which fuses with the seed coat in grains. Seed and grain are two structures produced as a result of the sexual reproduction of plants. Both structures are capable of developing into a new plant. They contain an embryo, endosperm, and a seed coat. Seed refers to the unit of reproduction of a higher plant, capable of developing into another such plant while grain refers to a single fruit or seed of a cereal used as food. Thus, this is the fundamental difference between seed and grain. Furthermore, the main difference between seed and grain is that the seed is the embryonic plant produced as a result of sexual reproduction while grain is a type of seed or fruit which occurs mainly in grasses. The three main components of seed are the embryo, endosperm, and the seed coat while the four components of grain are the embryo, endosperm, seed coat, and the bran. Hence, this is a major difference between seed and grain. Moreover, the fruit covers the seed of flowering plants while gymnosperms produce naked seeds without a fruit. In contrast, grains contain a fusion of the seed coat and the fruit. Also, viability is another difference between seed and grain. The viability of seeds is important while the viability of grains is not important. Besides, the seed can develop into a new plant while grains are used as food. Endosperm is used as food in seeds while the fruit part is used as food in grains. This is another important difference between seed and grain. 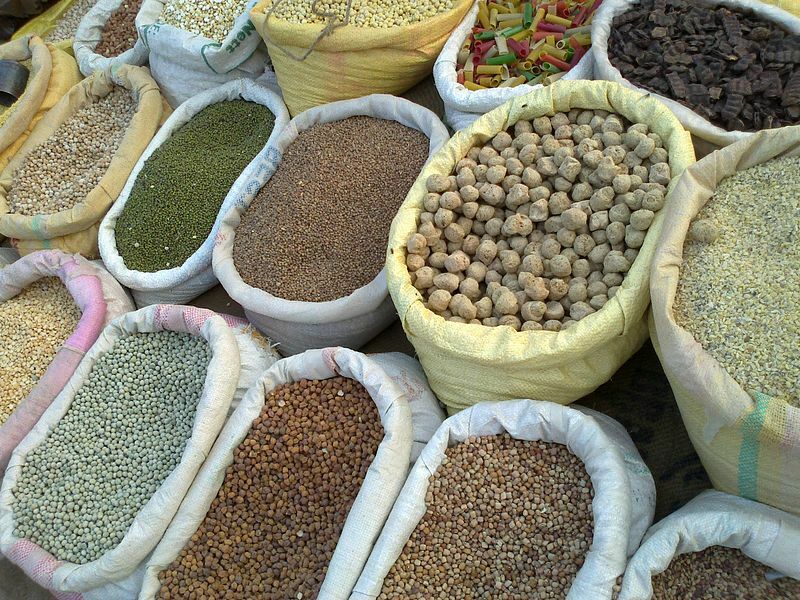 Seeds may be treated with fungicides and pesticides while grains are not treated with fungicides or pesticides. Moreover, seeds come under the preview of seed acts while grains come under food acts. Some examples of seeds are pumpkin seeds, sunflower seeds, and sesame seeds while some examples of grains are wheat, rice, corn, and oats. A seed is an embryonic plant produced as a result of the sexual reproduction of higher plants. Seeds of flowering plants are covered by a fruit while the seeds of gymnosperms are not covered by a fruit. Seeds can develop into a new plant through germination. In comparison, a grain is the seed of a grass. Generally, grasses do not produce fruits and their fruit is fused with the seed coat. These grains are mainly used as food. Therefore, the main difference between seed and grain is their components and usage.